Judge Bernie Bouchard is a lifelong resident of Cincinnati. His parents, doctors who practiced in Western Hills for over 30 years, instilled in him the values of hard work, education, and high moral standards. Judge Bouchard was appointed to the Hamilton County Municipal Court in 2006. He represents District 6 which includes Colerain Township, Green Township, Cheviot, and Springdale Township. Through his experience as a lawyer and magistrate, Bouchard possesses the legal knowledge and integrity to ensure that each citizen is treated fairly and with respect. Prior to becoming a judge, Bouchard was an Assistant Hamilton County Prosecuting Attorney for more than 5 years. He successfully prosecuted hundreds of felony and misdemeanor cases and tried over 25 jury trials. As the Director of the Sexual Predator Unit, Bouchard was the first to successfully prosecute sexual offenders with use of the '1000 Foot Rule' in the State of Ohio, which removes sexual offenders from school zones. He fought for sexual abuse victims left behind by the statute of limitations by drafting the first civil registry complaint in the State of Ohio. Judge Bouchard also served as a Hamilton County Juvenile Court Magistrate for 5 years, where he diligently presided over hundreds of felony and misdemeanor juvenile cases. He determined adult paternity and child support matters and adjudicated custody disputes. 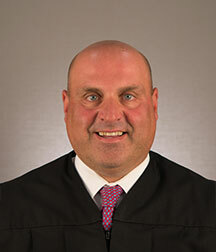 Judge Bouchard graduated from Saint Xavier High School, Xavier University, and Ohio Northern University College of Law. Judge Bouchard is actively involved in his community. He volunteered as a Green Township Magistrate from 2000-2005, he speaks at local schools about sexual offender issues, is a referee for grade school and high school football games, and a member of St. Ignatius Parish. He and his family reside in Green Township.